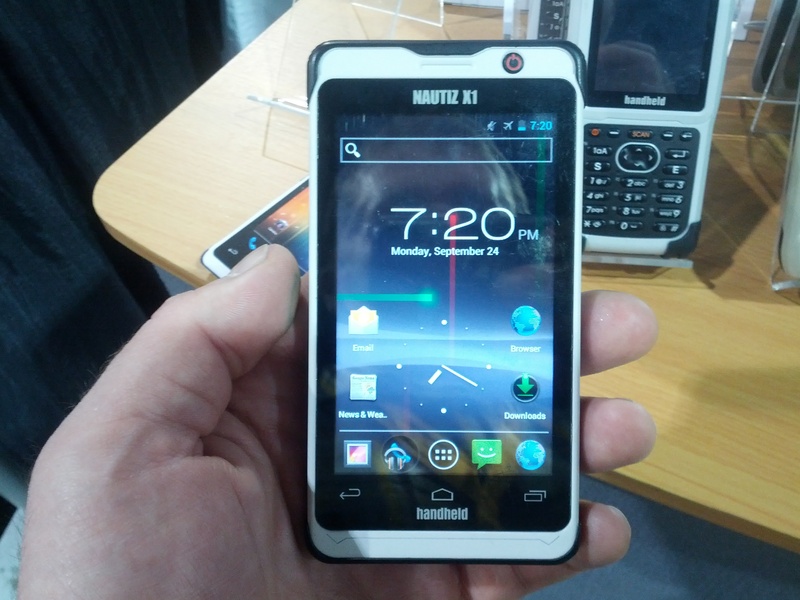 Handheld had a prototype of their Nautiz X1 Android phone at MinExpo, and we got to go hands-on with it. On first impression, it is SUPER light. It didn’t seem to have a battery in it to be so light, but sure enough a click of the power button started it right up. Stock ice Cream Sandwich was the flavor of the Android OS, which was expected. It ran smoothly and had fluid screen transitions when swiping left and right, though being a prototype there weren’t a lot of apps running to bog down the RAM. When asked about operating system upgrades (given the current Android OS is Jelly Bean, not Ice Cream Sandwich) the Representative was not sure of timing. This unit was also not connected to a cell network, so call quality could not be tested. Likewise, a device running Windows Mobile was not available at this time. The chipset is not manufactured by Handheld – they purchase it pre-made from a supplier though the representative could not say who was the manufacturer. This was expected, though a little disappointing – it would have been nice if Handheld had more control over the internals so company-specific modifications could be made for a run of devices. For example, it would be great to be able to add in a GPS chip capable of communicating with Trimble base station arrays to get higher GPS accuracy while on-site. Likewise, being able to build a device that can tie into a leaky feeder communications line underground would be a huge addition to the mining family. That may be an option down the road, but it certainly benefits handheld to try to fit as many industrial applications as possible rather than specialize in a product strictly for mining at this point. A drop test was not done while at the booth, much to our disappointment. Verdict – The Handheld X1 smartphone is a great option for someone who needs a ruggedized smartphone that doesn’t look like it mated with a G-Shock wristwatch. The light-weight design will surely appeal to many users as it won’t feel like carrying a brick. However, the mid-range specs will likely not appeal to “power users” who need the latest-and-greatest hardware and software – a Nexus device with an Otterbox would probably be the best option for them.